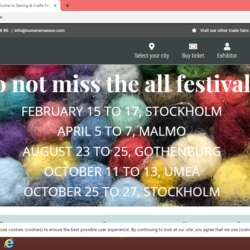 You must be a member of the Stockholm Arts and Crafts Group to attend this activity. Would you like to join this group? There will be different stalls were you can buy anything in order to get creative at home, also which is what I've been enjoying the most, is all the classes they have where you can learn something new for a small fee. This will be my 4:th time (twice in Stockholm and ones in UMEÅ). If you would like to meet up with me then l'll beProtected content unfortunately we will not be able to wait for anyone that might be late. The fare is between Protected content Sunday, one can obviously leave when one pleases. Depending on how it goes we might also have a fika in there to share experiences. ( As you can see, it already starts on the Friday so if Sunday doesn't suit you , you can always go on another day). BTW , try to buy the tickets in advance as it speeds up the entrance and you get a small discount.